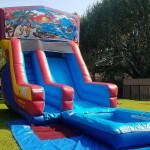 The small footprint makes Luau Beach Slide perfect for backyard birthday parties and small events. This Slide can be rented all year long either as a dry slide during winter or as a water slide during the summer. Great option for younger children because the pool is not very deep and big enough for children up to 12 years old.